METETI, Panama, May 2, 2018 — At any given time, around 200 members of the U.S. military will be housed, fed, and shuttled to and from work sites and living quarters while performing their duties as part of Exercise New Horizons 2018. 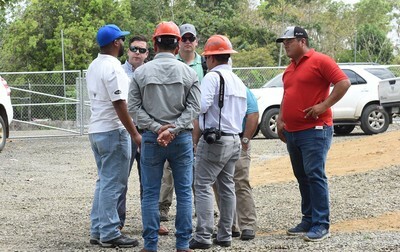 Negotiating, securing, and adjusting contracts for those services and many more falls on the shoulders of two Air Force non-commissioned officers conducting business in Panama City, Meteti, and several other towns and villages across the Central American country where construction projects and medical services are taking place. Air National Guard Master Sgt. Forrest Lipe and active-duty Tech. Sgt. James Richard ‘JR’ Mullis have already logged more than 380 hours of phone calls, 4,000 miles travelling to sites, and 1,200 hours of office, lunch and dinner meetings, to ensure the 346th Air Expeditionary Group has what they need to conduct their joint deployed training exercise. The planning process for all things NH18 began in 2017 with Air Forces Southern planning meetings and site survey trips to Panama for initial talks and requests for contract bids. On February 1, Mullis arrived in country and hit the ground running and at the end of March, Lipe departed his case work supervisor position at the Logan Correctional Center, a female max prison in Lincoln, Ill., to join Mullis working 12- to 15-hour days in finalizing contracts and building the relationships needed to accomplish their mission in the deployed environment. Building relationships and negotiating contracts in Panama versus in the United States has its differences. Conversely, according to Mullis, getting a contract signed in Panama requires multiple meetings at offices, over lunch, over dinner, and even then, multiple iterations of the contract back and forth so it can take weeks versus a few hours. On top of the time put in to work contracts, there is also the difficulty of having companies deliver their goods and services to Meteti, Panama, a roughly four-hour, 300-mile round trip from Panama City. Another issue the contracting officers face is that Panama City is a booming economical hub currently with high-rise building construction everywhere you look. That puts a strain on getting some necessary resources to the very rural town of Meteti, far from the investment dollars of the big city. For example, the concrete needed for the bases of all the building projects was too big of a job for the local companies, but too small for the booming concrete businesses in Panama City so the team had difficulty getting concrete. That didn’t stop the dynamic duo, in a win for concrete they found an unusual way to get the concrete needed to the five construction sites around Meteti. Just one example of how the contracting officers remained flexible yet undeterred to get the job done so the deployment mission can be met. And their customers couldn’t be happier with the level of support they’ve received. Revuelta, who’s tasks span the entirety of the New Horizons mission, include running lodging, meals-to include restaurants as well as MREs (meal, ready-to-eat), MWR operations (morale, welfare, and recreation), water distribution, and a host of other duties he’d have a much larger team to help with. Another twist to the usual contracting way is the tracking system they use. New Horizons 2018 is the test bed for a new way for the Air Force to conduct contracting operations, an all-digital format not used before. In previous years, contracting officers would deploy with multiple large hardened cases with a desk, computers, a book’s worth of purchasing order forms, and every bit of supplies they would need to conduct business. Now, they have one hardened case, roughly the size of two briefcases combined side-by-side that houses a tablet, printer, and some basic supplies as all the work is done digitally, even with contracts signed using their fingertip on the tablet.